My name's Hailey and I'm a mascara addict. In fact I'm addicted to everything makeup but this particular post is about one of my recent mascara buys. When I saw the packaging and the pretty display cases as I traveled across Europe the urge to buy something that I knew couldn't deliver what it was offering grew larger and larger until I caved. I bought Benefit's They're Real mascara along with a few other items and sated my hunger for new goodies. Something Good, Something Bad and Some Giveaways To Make You Glad.. The bad is we lost a much loved, feathered family member on Friday night. Our beautiful Rainbow Lorikeet, Max, had been a bit off for about 24 hours and mum and I were terrified that he would die if we didn't get him to a vet so at about 11:30pm on Friday night we rushed down to the local emergency vet clinic. We were told he most likely had heavy metal poisoning from nibbling on something he shouldn't have, the vet recommended fluids and an antidote injection and then a trip to a bird specialist the following day to confirm the condition and follow up on his treatment. We agreed. She asked us to wait a few minutes while she gave him the shots and she would bring him right back so we could take him home. Well we sat in the consultation room for an hour and a half before she came back. She said he had suffered a seizure and died while she was treating another animal. He never even got the shots that he needed. I'm furious. I can't believe that she took him away and then just left him alone when he could have stayed in the room with us and at the very least not died alone. Also they still charged us the $200 for not helping our pet. I'm really disgusted by the way it was handled. He was only 11 months old. Now lets get on to something to lighten the mood. there are a whole bunch of blog giveaways going on at the moment and you have to get on them!! First up we have Chelsea's 100 follower giveaway over at superpurdy. There are a great bunch of goodies here so don't miss out on the chance to win. Also a big congrats to Chelsea on reaching 100 followers! 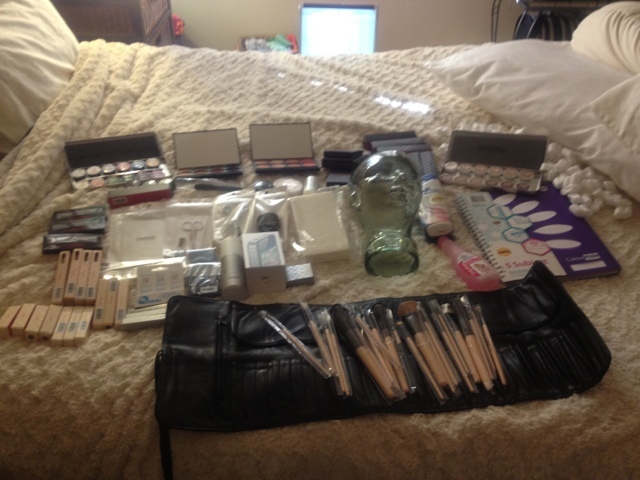 Next is Jasmine's 250 followers giveaway at sweetaholic-beauty. She has your lips and eyes covered with this booty! Congratulations to you too Jasmine on your 250 followers milestone! Alice who is celebrating her 800th follower at aliceboullin is giving away a set of OPI Minnie Mouse collection nail polishes. Congratulations Alice! Our final blogger celebrating a follower milestone is beautymakeupaddict who has just reached 1000 followers and is giving away a bunch of drool worthy goodies! Huge congrats is in order! I'm unable to supply a picture but the link above will take you straight there so you can check out what is up for grabs. And last but certainly not least.. Jessica has a summer giveaway with 3 prizes over at pasionstarbutterfly!!! You must check this one out! Huge thank you to all the ladies for giving us the opportunity to try to win these! Few updates.. First, I'm without Internet so I'm currently typing this up on my iPhone so please forgive me if there is something wrong with it, I don't have the control that I usually would if I were using my laptop. Secondly, I started my diploma of specialist makeup services today and I love it already!! Only thing I worry about is organising work experience, please God grant the professional MUA's that I contact over the next 6 months the serenity to put up with my incessant nagging and pestering! Last but not least I have a little haul to share with you all.. The photo is terrible, I know, so sorry! Included are a new brush kit, glass head for creating bald caps, new iPhone (thank you insurance! Without it I would be lost), nail polish remover, shampoo and conditioner, a notebook for school and my makeup kit and essential tool kit.. Everything from primer to safety scissors. I hope to have access to the Internet by Monday. Fingers crossed. Magnetic freedom palettes.. I want them, I need them, I want them and I want them some more but I won't pay the price for them when I know perfectly well what the most popular ones are made of.. Paper, paper that can't be washed or sanitised without potentially damaging the product that you just forked out around $30 for not to mention the shipping price. No Thanks. I Can't Wait To Do This Myself One Day..
Abigail over at Shrinking Wallet is giving away a whole bunch of goodies! Dream Makeup is giving away your choice of eyeshadow palette! Rida over at Madame Hot Lips is giving away 3 BH Cosmetics 2nd Edition palettes! Huge thank you to the lovely ladies who organised these, it inspires me to start getting some giveaway loot together! So what are you waiting for?? Get on it!! Oh dear Lord above please let it be!! What makes the rumor all that much sweeter for me is that they are supposedly scouting locations in Melbourne. You can read more about it here. Now everybody cross your fingers and toes and pray to the fashion gods that we will soon have H&M stores popping up all over Australia and they won't be ridiculously priced. Now all we need is Primark to shake their money maker over the deep blue and set up shop on our shores! Just something quick to fill a makeup hole! Glitteratti lips! I Nuovi Professional - Glitteratti Cosmetic Glitter in Blonde Fever. Glo Minerals - The Cherry Balm. Bourjois - Effect 3D Gloss in Rouge Democratic. 2 small lip brushes for application (not pictured). Today I'll be reviewing the Benefit - It's Potent! Eye Cream. Today I'll be reviewing the Benefit - Total Moisture Facial Cream. Today I'll be reviewing the Benefit - Refined Finish Facial Polish. Each day this week I'm going to review skincare products by Benefit. I have 6 in total so if you are interested in knowing more I recommend coming back, I wrote an essay yesterday for my first post and I don't plan on doing that again unless absolutely necessary. I have a story to tell. It is the story of my beauty dream and how it started. I suppose it started 27 years ago when I was born, I guess everyone's story starts with their birth doesn't it, I think my story might be a little different to other beauty dream stories because unlike other MUA's/Beauticians/Guru's and people just generally obsessed with everything to do with beauty, I didn't spend my whole childhood destroying my mothers makeup collection or waste my pocket money on coloured mascaras, bright pink blush or mismatched foundation.